Although I am pretty satisfied with the gear I have, there is always the room for improvement. Or for getting a new shiny toy, right? 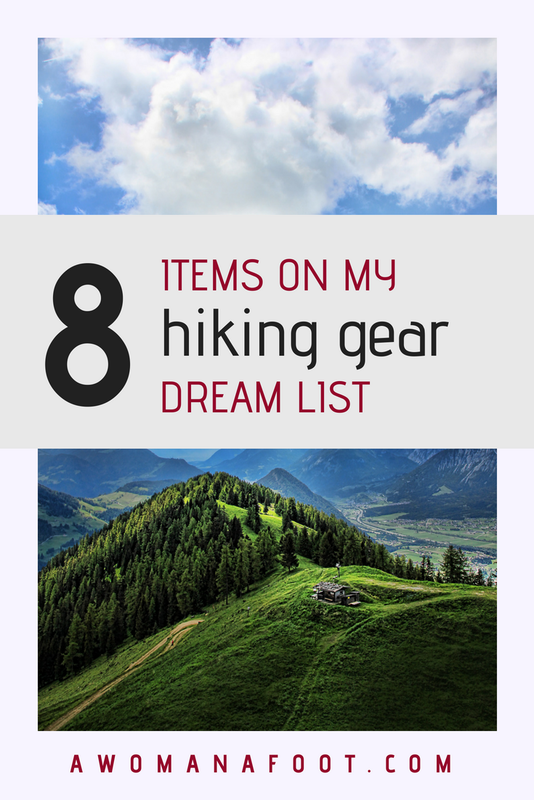 Here is a list of stuff I would love to add to my hiking gear – for more comfort, safety or fun. Disclaimer: This post, in addition to some awesome tips and advice, contains affiliate links to respected retailers for your convenience. It means that if you buy anything through those links, I receive a tiny commission at no extra cost to you. Thank you for your support! Let’s start with the most expensive one – a hiking watch. I don’t care much for the GPS as I find the one I have on my phone pretty good. I am not a wilderness trailblazer so I need the phone apps for support and confirmation, not survival. But the hiking watches have a few other things I love – one is the precise reading of my position. When I was hiking in Scotland in a horrible fog, I met a group of hikers from Austria and one of them had that kind of watch. She could read that we were exactly at 550 m above the sea level (or something of that kind) which helped finding our position on the map. I loved it! This could be such a help in bad weather condition to place you on the correct spot. Recently I got the Hoka One One Women's Tor Ultra Hi Boots and I absolutely loved them. The extra cushioning was exactly what I needed for my feet to not hurt. My feet are extra sensitive to touch and long walking on hard surfaces or rocks make them hurt badly. Hoka One One helped significantly in it. Hoka One One Mafate are the lower trail running option.You can see the HOKA ONE ONE EVO Mafate variant here. Although the high boots are very light, they are better for colder weather. In the summer and on lighter trails where the (superb) ankle support is not needed as much, the lower Mafate shoes would be perfect. They are really pricey but well worth it. I am a big fan of using hiking poles; I don’t even want to think about hiking without them. The only thing I would love to change is the handle. When it’s completely vertical it places too much strain on the wrists as they have to bend in unnatural way. There are hiking poles out there which have their handles under a slight angle to make holding them more natural. I am not sure how it would influence using them as support for my tent, though, but my arms and wrists comfort is more important. I also would like to change the handle's material - my old trekking poles have foam handles, which are better than rubber, but not as comfortable as cork ones. I hope to update to cork handles with my new purchase. The hiking poles I use now are all beaten-up and rusty – although they still work. I learned from it that I prefer a bit heavier but sturdier poles. I’ve heard stories about the carbon poles snapping easily – but mine have been through a lot over a few years, including using them to pitch my tent, banging them uncounted times on rocks, getting them stuck between rocks, etc. – and they still work. Another reason why I will never be ultra-light hiker – I prefer sturdiness over ultra-lightness. I know, I know, a bit weird item to place on a wish list. It’s a pretty boring thing, right? But finding a good pair of hiking pants seems to be a really hard thing. I have many pairs – most of them I got second-hand because the price for those things is ridiculous. Many of them just don’t fit well. I am not sure if my body is weirdly shaped or something but I have a hard time finding a really comfortable hiking pants. As I put on some weight recently, it’s even more difficult now – even if a pair fits well over my hips, they pinch painfully in the waist. Not all women have hour-glass figure! Actually, most don’t. Another issue with hiking pants is their length. I'm 160 cm and the average height of women is just about 5 cm more. So why most pants I try on are made for women at least 175 cm tall? I can't just buy them and ask someone to shorten the legs because they are often profiled, so I would have the pants' knees around my calves. For the January winter adventure I couldn't take my old pants because I put on weight, so I grabbed a pair of Patagonia which was fitting well over my hips... but were some 20 cm too long! I had to stuff the leg under shoestrings to make them usable. I have a good rain jacket I like – the Marmot Women's PreCip Jacket (you can read the review here), which has been serving me well for a few years now. But very often it’s not the rain but icy cold wind that is the problem. My jacket is actually not the best wind protection thanks to its breathability. I would love to have a nice, tiny and light jacket that would just keep the icy winds at bay. They are crazy expensive thought, so they are still on the wish list instead of my packing list. Now this one is even more elusive than a good pair of hiking pants. I really can’t get why it’s so difficult to make one. I have two pairs of merino bras – nice but tend to be sagging and don’t hold anything. Also, the one by Icebreaker is way too high on the neck (in the back) - it's annoying. They also don’t dry as fast as synthetic ones. I have one by Arcteryx which is pretty good – unfortunately I should have gotten the large one instead of medium. It’s much more elastic and supportive than the merino one but its straps got all out of shape fast, I think they were way too thin. Also,because it’s just tiny bit too small for me. But for whatever reason I can’t see it anywhere to buy the size up. Many online hiking clothes stores don’t have any kind of bras! How is it possible? I have a few regular sport bras at home but I find them too thick for hiking. You don’t need much support when you walk – no need for the tank-like fancy sports bras made for jumpy sports. I want something that holds my breasts, is breathable, easy to put on/off and dries very fast. And doesn’t cost and arm and a leg. Come on, manufacturers, do something! When I was still using my Sony RX100 III camera there was no problem – it could fit in my backpack’s belt pocket. But as I recently upgraded to Sony Alpha a6500 , it can't fit anymore. And I struggle with the best way to carry it while hiking. For my recent hike I just carried it across my neck and chest, under the breast strap. It wasn’t too bad but still was bouncing a bit sometimes. I also had no way to protect it in bad weather, so I had to put it into my backpack when it begun to rain. I also noticed that the camera's strap was ruining my shirt - there was pilling where it was rubbing against it. I needed to wear a buff all the time otherwise the strap was scratching my neck. It was even harder when I changed the lenses into the wide-angle prime, which is bigger and heavier than a regular kit lenses. After a while I started to feel the weight on my neck and arm. As it had its hood on, it was big and I was hitting it often while moving my arms. I am not sure what would be a better solution. I have seen clips you attach to the backpack’s strap and you clip the camera onto it. It looks like you can use it even with dSLR cameras so for sure with my smaller mirrorless. I was wondering, though, if you don’t feel your backpack to be off-balance with the weight only on one side. Do you have a good advice on carrying bigger cameras while backpacking? Let me know! I find those small packable backpacks a must-have for longer backpacking trips. I use them while on plane or on a bus, for day trips around a town or short day-hikes from a campsite. They are tiny when packed and often can be stuffed into their own pockets. I’ve been using one by the North Face but it’s been slowly reaching its death. The waterproof layer is almost completely gone and peeled off. This time I want one made entirely from waterproof material so there is no peeling of the insulation. I have my eyes on the Sea-to-Summit ultra-sil bag as it can be used also as a stuff bag and is barely-there light. What is on your gear dream list? Do you share anything with mine? Gear and Gadgets to Take Your Camping Experience to the Next Level! The Quest to Lighten Up my Gear Continues! Share it with the world and pin for later!